Well before the world goes to hell, all of FF6’s leads are isolated and hurt in one way or another. Terra, the green-haired scion of a magical demigod race called Espers, is enslaved and exploited by a human empire. Celes, one of the youngest and most gifted leaders in that empire, struggles as a woman in a patriarchal military. Setzer the gambler and Locke the thief drift from adventure to adventure having lost their lovers. Prince Edgar inherits his kingdom too early, while his brother Sabin lives as a martial-artist hermit in the wild, both of them coping with the death of their father by acting out in different ways. And the rest of the freaks they meet along the way, from the feral Gau, living among animals, to Shadow, the stoic badass ninja, have lost family and homes as well. That crew comes together naturally as the Gestahlian Empire continuously oversteps its bounds in a quest to control not just the world but also the forces of nature itself. Locke meets Terra after she escapes her captors in a lonely mountain town. They seek refuge with Edgar, who’s backing a rebellion against the empire. They take in Celes after she refuses to obey her superiors’ brutal orders. And so on. During the first half of the game, it seems like a familiar and comforting story. These people are busted up by their lot in life. Like many real people, they find new family through shared experience, and together they topple their oppressors. It’s Empire Records by way of Tolkien, with our gang taking down the empire and freeing the land. But only until halftime. Some tragedies can’t be stopped. Ultimately, the team doesn’t have to defeat the empire, because the real danger is Kefka, a megalomaniacal fop and magician who is only working for the emperor so he can gain access to more power. He eventually taps into the very foundation of the world, a trio of gods frozen in time, and breaks the entire realm in the act. Terra and her crew try to stop him, but it’s too late. Continents tear apart, the sky stains red, monsters roam the land, and our band of damaged fighters is cast to the wind. The World Of Ruin is born. The landscape and experience of the World Of Ruin should be familiar to anyone who’s been truly hurt. If a loved one dies or you’re traumatically injured, recovery starts small. Myopia is a crucial part of the healing process: You focus on the small things in front of you to get through the day. 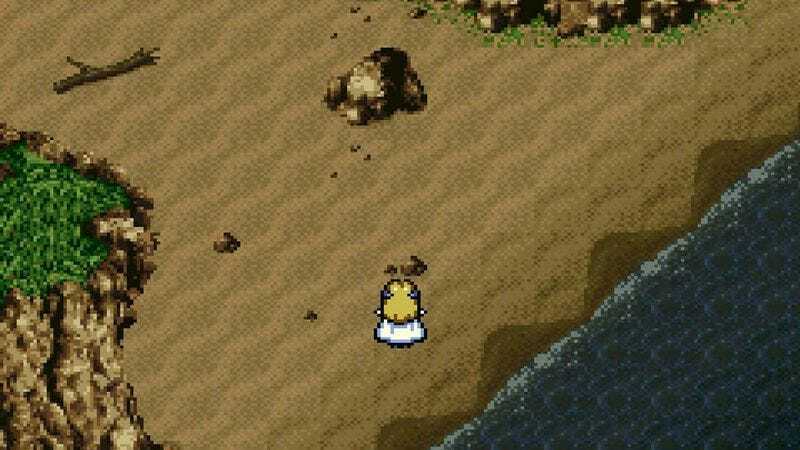 When Celes wakes up in Final Fantasy VI, a year after Kefka broke everything, it seems like all that’s left in the world is a tiny island. Cid, an old engineer and Celes’ surrogate father, has been caring for her, but now he’s ill. At first, all you can do is go to the beach, catch fish, and feed Cid. That’s it. Go out onto the only land left, get something to eat, help who you have left. The healing process can’t stop there, though. You have to build a life again. When Cid seemingly dies, it’s too much for Celes. She attempts suicide, jumping off a cliff at the north end of the island. Even then she survives, saved by a bird wrapped in a bandana that looks a whole lot like the one Locke used to wear. After finding a raft left by Cid, Celes heads back out into the world at large, not knowing whether she’ll find anything to help get back on track. Like anyone who reemerges into the world after a long absence, Celes finds that everything is different but oddly familiar. Instead of three large continents, the world is now an archipelago, shattered into a multitude of islands. Everything’s a little bit smaller and different. The Veldt is still there, but the monsters roaming its plains have gotten nastier. The Opera House in the west remains, keeping survivors entertained. Sitting in the center of the south, though, is Kefka’s tower, a monument to your failure. The landscape is scattered but similar and with obvious reminders of what brought you down in the first place. Even small villages like Mobilz still stand. That’s where you find Terra, living in a situation not dissimilar to Celes’ existence on the island. She stayed local, refusing to fight and caring for children orphaned by the cataclysm. When you find her, she’s not ready to leave her own island. Every stop you make throughout the World Of Ruin leads to one of your surrogate family members, each person as isolated as this new realm’s crumbled specks of earth. Shadow, the ninja, brawls without purpose in the north’s new coliseum. Locke wanders caves seeking a legendary phoenix to revive his dead girlfriend. Everyone is more broken and isolated than they were before, but they’re tied together through their shared failure. The World Of Ruin draws you to each of them, using that altered familiarity as a lure to your lost friends. Final Fantasy VI spells everything out in its final confrontation. The band does get back together, and they take on the nearly omnipotent Kefka, who goes on about how loss and destruction is the inevitable fate of everything living or otherwise. “It’s not the end that matters!” says Terra, “It’s knowing that you have something to live for right now, at this moment! Something you’ve worked for, something that’s worth protecting! As long as you have that, that’s enough!” Kefka mockingly asks if the party found their “somethings in this broken world that just won’t die.” Even without their answer, it’s obvious they did. They each found their reasons to keep going in a world that only appeared to be ruined.